Red wine is not really compatible with cooked meats. Although salt tends to soften its tannin, spices – especially pepper – and the fat of the meat harden, dry up seriously the tannin (ferrous aspect) and thus really compromise the harmony with a red wine. This observation leads us to recommend you some white or rosé wine, to “cut the fat off” rich dishes such as cooked meats. The smoked part of ham or the peppered part of dried sausages will create delicious mixtures of flavors with the woody part of the cuvée “Fût de chêne “. The salty part of a Prosciutto di Parma, of a Corsican dry ham – Prisuttu – of a Culatello di Zibello or of a Pata Negra de Bellota will perfectly go well with the acidity (in the oenological sense) of the cuvée “Tradition” and the fruity part of the cuvée “Symphonie” will surprisingly go well with andouillettes with mustard, white sausages or pastries. Be careful not to choose a terrine that has already been flavored with alcohol. Appetizers are varied and numerous (slightly smoked fishes, salmon, trout, eel), served on toasts, as rillettes, steamed or marinated. They can be served as brochettes or on skewers (sea bass, sea bream, salmon), taramasalata, eggs of trout or salmon on blinis, fried shrimps or just salted, raw vegetables (cherry tomatoes, radishes), stick-shaped vegetables (carrots, celery, endives) accompanied with a sauce made of fresh cheese or yoghurt with a slight note of chives, tarragon, parsley, mint or in tempura (Japanese fried food), foie gras on gingerbread toast, ham on the bone skewers with pineapple, prunes with bacon, marinated vegetables “à l’oriental”, West Indian mini-sausages (provided they are not too much peppered), raw vegetables with paprika sauce, small strips of fruits (melon of Cavaillon, mango, vine peach) or whole fruits (strawberries, cherries, raspberries), light gougères (type of French pastry), Serrano ham curls with melons or figs, assortment of various breads: white, black, with cereal, olives, walnuts, lardons, Comté cubes, Parmesan cheese or mimolette cubes, gruyere skewers with cherry tomatoes, of Cantal cheese and grape. If you wish to accompany your appetizers with some champagne, you better choose dishes favoring the freshness and some well-balanced champagne, that will go well with the various dishes, such as the cuvée “Tradition” or the cuvée “Crescendo”. 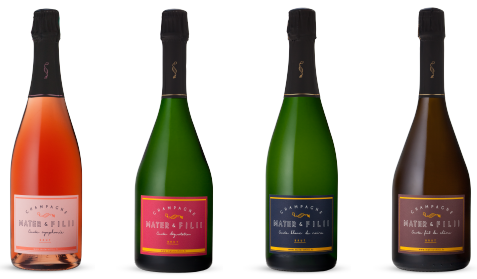 To accompany a semi-cooked foie gras terrine with powerful flavors, Mater & Filii advises you to choose some rich and fat champagne, dominated by the Pinot noir, such as the cuvée “Dégustation” or the cuvée “Blanc de noirs”, some woody-tasted cuvée, such as “Fût de chêne “, or some sour-sugar-balanced cuvée (even a bit more centered on the sugar), such as our cuvée “Symphonie”. On hot foie gras with apples for example, the marriage works marvelously. The melting part of the foie gras is toned up by champagne, wine is wrapped up by the texture of the dish. 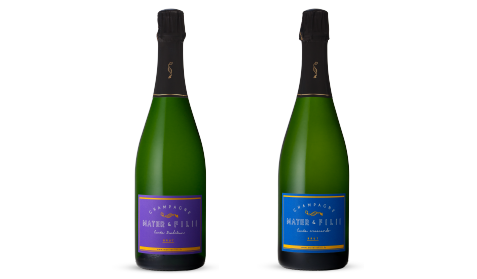 Again, the cuvée “Dégustation”, the cuvée “Blanc de noirs” or a woody-tasted cuvée, such as our “Fût de chêne”, will perfectly go with it. 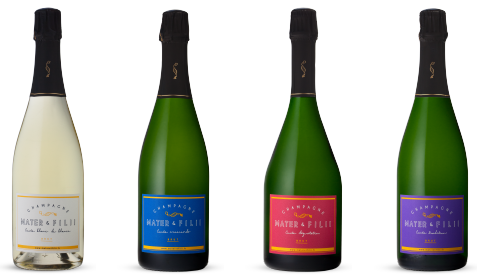 To accompany more savory meats, such as beef and especially lamb, the House Mater & Filii advises you some strong, vinous and mature wine, as the cuvée “Symphonie”, either with some Pinot noir, such as the cuvée “Dégustation” or the cuvée “Blanc de noirs”, or woody-tasted cuvées, such as our “Fût de chêne “. Visually, for red meats, some champagne rosé such as the cuvée “Symphonie” is strongly recommended to match colors. As for single dishes, they offer the opportunity of cultural contrasts: beef stew will oppose its rustic character the sharpness of the champagne Mater & Filii. Beef with carrots or osso-bucco will perfectly go with some champagne rosé, such as the cuvée “Symphonie”. Seafoods and shellfish have their own specificities: strong and sometimes mineral flavors, iodized flavors that remind seaweeds, or rather delicate, soft, fine, more pleasant and more sensual flavors. Their textures are smooth and silky, firm and resistant, or soft. 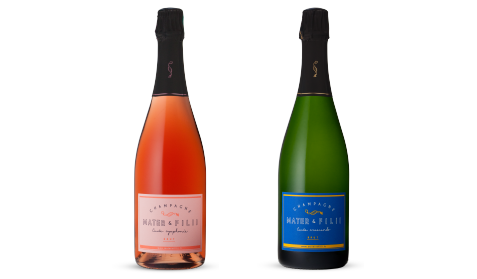 The combination with types of wine from Champagne play with the diversity of some and others. 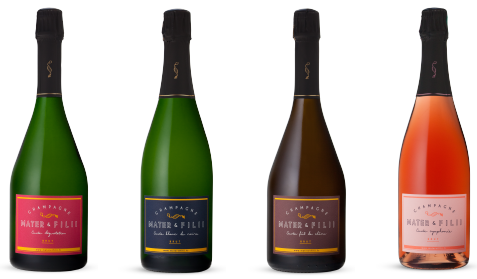 Generally speaking, Mater & Filii advises you to accompany seafood dishes, fishes or shellfish with some elegant and mineral wine, rather influenced by the Chardonnay, such as the cuvée “Crescendo” or the cuvée “Blanc de blancs” and sour-sugar-balanced beverages with a pronounced acidity, such as the cuvée “Tradition”. 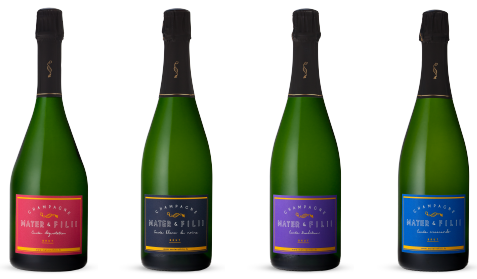 Fresh water fishes, such as zanders, pikes or trouts will perfectly accompany some fresh and delicate champagne, such as the cuvée “Blanc de blancs “, whose froth will contrast with the butter or the cream that compose these dishes. Sea fishes, such as sea basses, soles and red mullets will perfectly go with champagnes that are well-balanced between white grapes and black grapes, such as the cuvée “Crescendo”, the cuvée “Dégustation” and some sour-sugar-balanced champagne with a pronounced acidity, as the cuvée “Tradition”. With mixed dishes, avoid the bouillabaisse or the bourride that are too dominant. On the contrary, couscous of fishes will reveal some surprising fish/champagne associations. Very flavourful, their flesh is delicate, fine and silky. 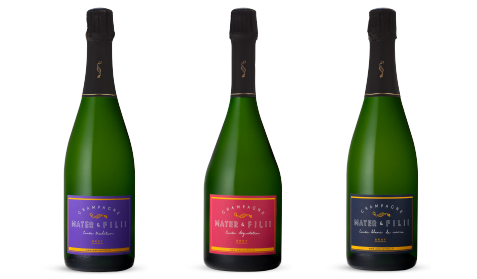 Some fresh and round champagne such as the cuvée “Crescendo” accompanies their soft flavor revealed by a natural cooking. Their fine and tight flesh is soft and pleasant. Whether you decide to have it fried or steamed, they will join the bitter-sweet category, with the cuvée “Symphonie” or the cuvée “Crescendo”. 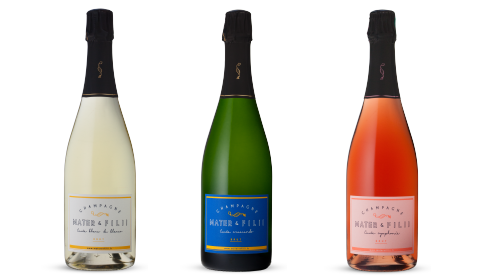 With their ample, noble and subtly marine taste, whether they are prepared raw, in a carpaccio, fried or steamed or accompanied with a fennel sauce for example, they can be served with some quite full-bodied, mature champagne, such as the cuvée “Dégustation” or the cuvée “Blanc de noirs”. They will also perfectly go with woody, subtle and persistent aromas, such as the cuvée “Fût de chêne “. These shells have a hazelnut and almost sweetened aroma, with a note of iodine. Therefore, they express a delicate sensualism. 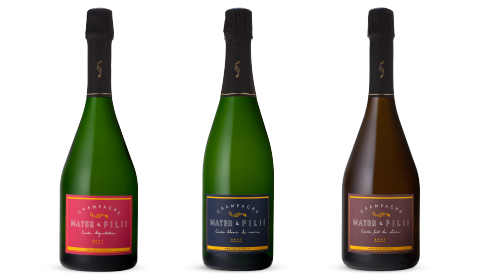 Whether they are served raw or cooked, with – of course – a dash of olive oil, some zests of ginger or even served with a light sauce made of saffron cream, they require some powerful and structured champagne that has ripened in a cellar for a long time, such as the cuvée “Dégustation” or the cuvée “Blanc de noirs”. These big and very delicious shrimps, cooked in a “court-bouillon” or steamed, will perfectly go with some fresh, tonic, firm and frank champagne, such as the cuvée “Tradition” or a brut champagne dominated by the Chardonnay, such as the cuvée “Crescendo” or the cuvée “Blanc de blancs”. Their orange-colored coral with a soft texture reveal some smooth, pleasant, fine and iodized flavors. 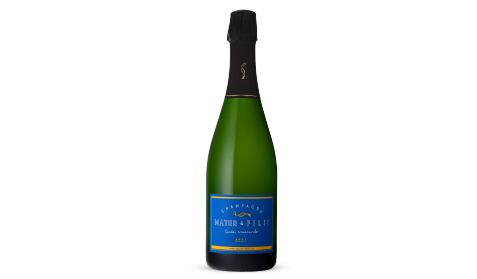 The cuvée “Dégustation” or the cuvée “Blanc de noirs”, with a firm, mineral and fruity character, will accompany it ideally. There are various types of oysters. They are to be eaten ideally plain, without lemon nor vinegar with shallots. 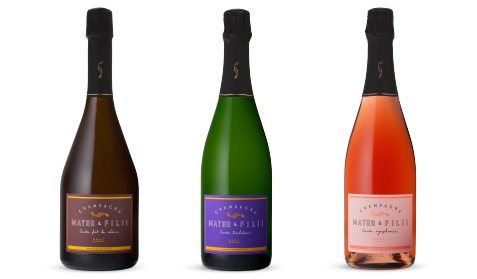 Some sharp, fresh and light champagne, such as the cuvée “Blanc de blancs” or a slightly fruity and sweet champagne, as the cuvée “Symphonie” will be excellent companions. Certain meals inevitably require more elaborate sauces that reveal the flavors of the dishes. They obviously determine the choice of champagne. Butter cream-based sauces that have to be lifted by fresh herbs, by capers, or by a bit of lemon, will be accompanied with some rather powerful and fleshy champagne, as the cuvée “Dégustation” or the cuvée “Blanc de noirs”. Sauces made with plain olive oil or flavored with macerated herbs (basil, tarragon, chives, thyme, dill) will be appreciated with some fresh and fruity champagne, as the cuvée “Tradition” or the cuvée “Crescendo”. 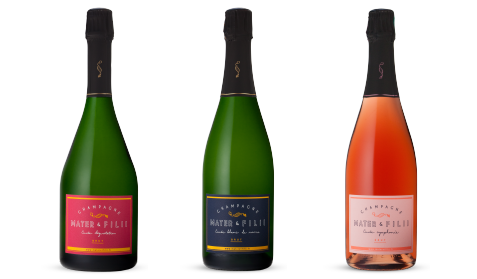 As for mayonnaises, whether they are simple (with peanut oil or olive oil) or slightly lifted with herbs or spices (curry, saffron), they will also perfectly go with some fresh and fruity champagne, as the cuvée “Tradition” or the cuvée “Crescendo”. Garlic, vinaigrettes and pickles are to be avoided in any case with champagne. It is probably with poultry, farm chickens, guinea fowls or capons that champagne rich in Pinot, such as the cuvée “Dégustation” or the cuvée “Blanc de noirs”, finds his best partner. When eating roasted poultry, a fricassee or boiled chicken, the supple and tender texture of the meat goes very well with the cuvée “Blanc de noirs”. The light aromas of the dishes do not hide those of the wine. The cuvée “Blanc de noirs” will also perfectly suit preserved poultry, with sauce or richly stuffed. When poultry is cooked with mushrooms, some champagne rosé, such as the cuvée “Symphonie” will perfectly suit . 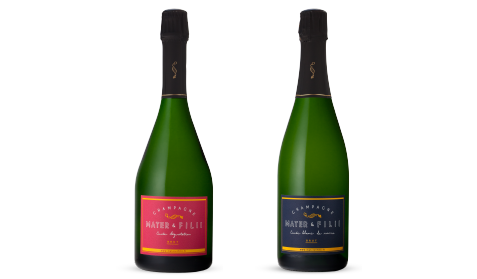 To accompany the oriental cooking, Mater & Filii advises you some strong and spicy Pinot meunier champagne, such as the cuvée “Tradition”, or with some Pinot noir such as the cuvée “Dégustation” or the cuvée “Blanc de noirs”. 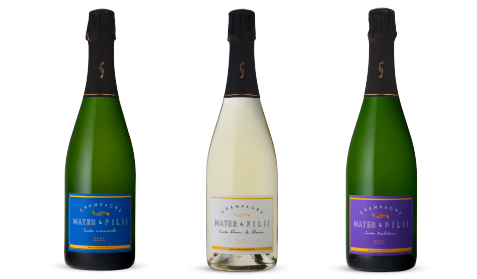 To accompany cheese, Mater & Filii advises you some rich and fat wine, quite dominated by some Pinot noir, as our cuvées “Dégustation” and “Blanc de noirs”. The association of the coulommiers and some champagne is obvious. The cuvée “Dégustation”, which is quite full-bodied, will therefore allow the softness of the former to sublimate the sharpness of the latter. We can also name the Maroilles cheese, the camembert, the reblochon, the comté or the Brie cheese. Any cheese with parsley added on it should be forgotten. Sorry. 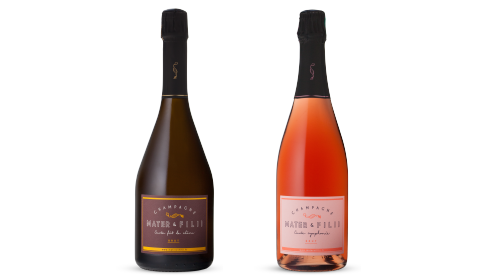 To accompany desserts, Mater & Filii advises you some well-balanced wine, quite dominated by the Pinot Meunier with an sour-sugar balance leaning towards the sugar. Avoid the association with chocolate which goes way better with champagne ratafia. It is the association with red berries, particularly raspberries, strawberries, wild strawberries, redcurrants, blackcurrants, blackberries or forest fruits that is the most known. 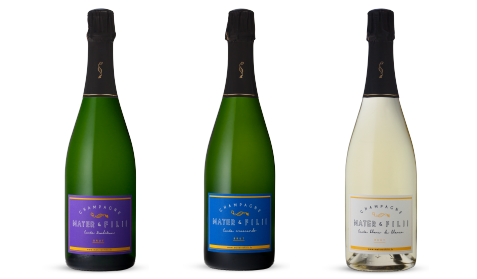 Some fresh, sharp and light champagne, as the cuvée “Blanc de blancs” or the cuvée “Crescendo ” will find its place here. 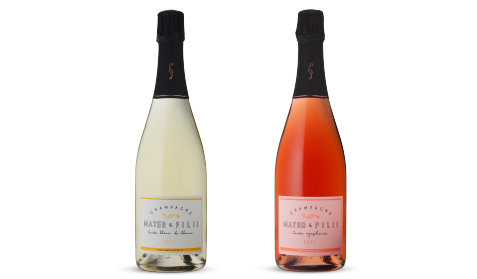 Delicately sweetened or accompanied with some whipped cream or chantilly, these fruits will be in perfect harmony with some champagne rosé, such as the cuvée “Symphonie”, whose roundness and fleshy character perfectly go with the sweetness of raspberries or wild strawberries. Yellow fruits (peaches, apricots, greengages, nectarines, mirabemme plums) or exotic fruits (pineapples, bananas, mangos) can be served with the woody-tasted cuvée “Fût de chêne ” or the sweet-tasted cuvée “Symphonie “. Can't find the meal you were looking for ?